Baby, baby, baby! These showstoppers will delight any new mother or mother-to-be. Choose from pink, blue or yellow/green. 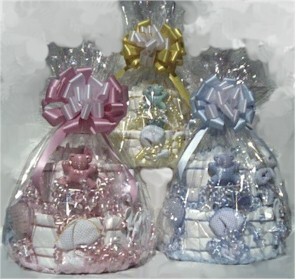 These �confections� contain approximately 40 diapers in graduated sizes all completely usable! They also contain useful baby items, such as a rattle, bath-thermometer, onsie, comb and brush set, sock sets and lots more! Click below to add a cake to your cart!